With a boat that had no use. Since then, we learned the boat has been used six (6) times in the last 4 years. 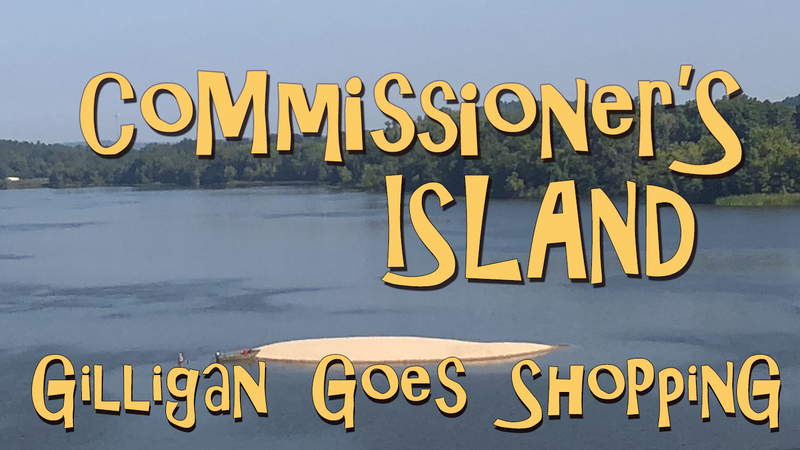 In this episode, we will take a look at the items purchased for “carrying out the purpose for which the boat was intended.” For anyone who has forgotten, that purpose was to fill “the need for independent and quick responses” to complaints about debris in waterways. Better get ‘er stocked up! Skipper: Go to WalMart and BassPro and get everything we need to set sail! Oh. Hell. Yes. Everyone needs an automatic inflating PFD, right??? And for only $249.99? A bargain at any price – today and today only! TWO PLEASE! 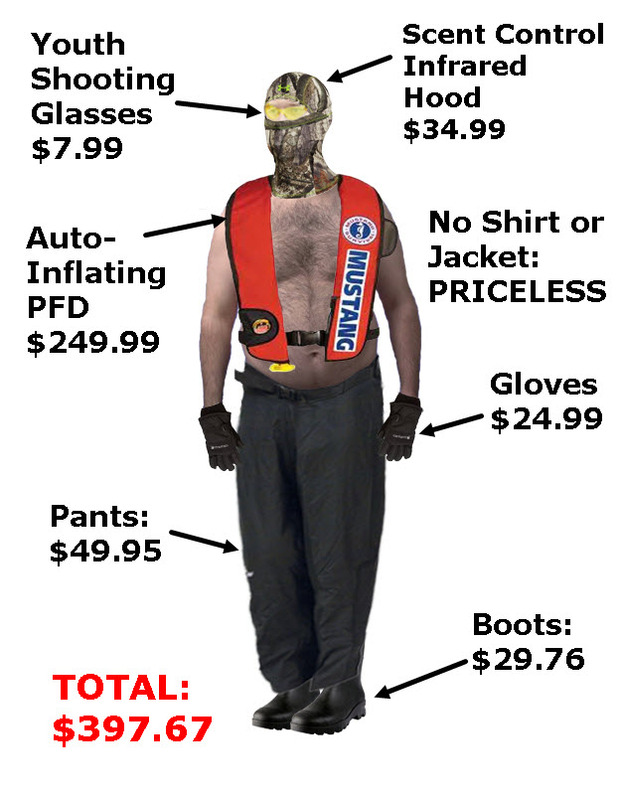 Question: if you slip and fall in say, 6 inches of water, and that PFD deploys, can you put the genie back in the bottle, or is this just a $250 one-off flotation device? The boat can accommodate like 4-5 people, so grab a few more cheap($45 – $65) life vests for the “regular” people. When you are out on the water with the wind in your face, you don’t want to get cold, and you sure as HELL don’t want any debris to smell you approaching. Without a doubt, you need the Under Armour ColdGear Scent Control Infrared Hood for $49.95! TWO PLEASE! You better get some gloves and warm pants as well! And since you are going to be on the water, you definitely need some boots. Size 10 and Size 12 should do for the crew (of how many?). OH!! AND THESE! YES!!! YOUTH size shooting glasses!!! GIMME THREE OF THOSE!!! Ok, that’s everything we need to wear, right? WOOOOO DOGGIE! Now that’s SLICK!2 I mean, can you imagine this guy being undercover and then just flat out flailing through the shallows and charging the debris?3 The debris would never see him coming! This is not everything purchased. 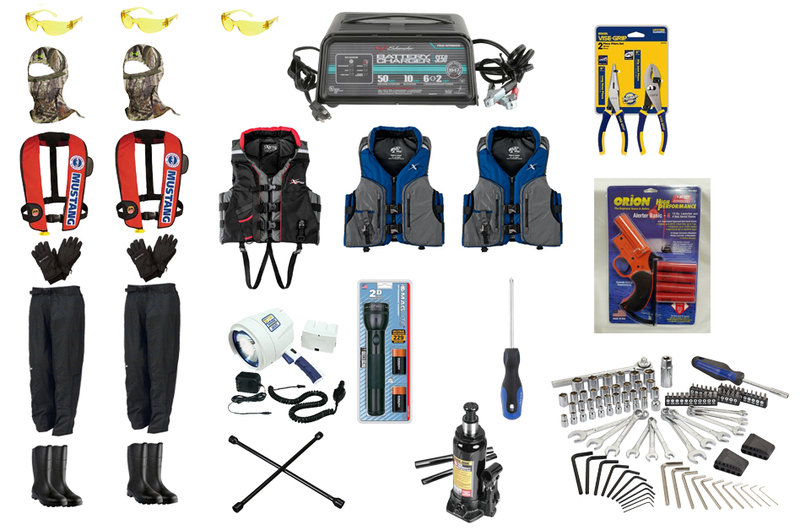 In fact, most of the other stuff not pictured is stuff you would need on a boat, like an anchor, a couple of paddles, a throw float, and of course a tow kit for one of the COSL trucks to pull the boat. But these are some of the more curious things. They bought two flashlights, and a Marine Blue Q Beam Halogen Rechargeable Spotlight “with glare-free, blue-tinted glass lens to cut through fog, glass or rain”. Now maybe they missed that they had ordered up the boat with a Q-Beam as well, or perhaps they were going to have Q-Beam light wars. Who knows, but they’ve got plenty of lights for finding debris in the dark now. And a flare gun. OH WAIT!!! THAT must be what the three pair of youth size shooting glasses are for! But…it has four shots…and there are only three pair of glasses. Man, talk about a conundrum! They also bought a fine set of wrenches and a multipurpose driver with every kind of head imaginable, which begs the question, why did they buy two separate screwdrivers in addition to that?4 And they bought separate pliers. Why not buy a single tool kit with everything you need in it instead of having several loose tools floating around? Maybe even buy a marine toolkit, which would have all the tools you were likely to need on a boat, instead of this piece-meal tool setup? But I digress. A 6 ton bottle of Jack would have made more sense to me. Nonetheless, I’ve put a lot of thought into this one. At first I thought maybe they could use it to jack up some debris, but then…no…it’s not waterproof, so no jackin’ in the water. Maybe it’s if something breaks in the boat. That doesn’t make any sense either. Definitely no jackin’ in the boat. It has to be for the trailer. You know, in case it gets a flat at the same time the truck pulling it (which also has a jack) gets a flat. It would obviously need its own jack so the trailer tire and the truck tire could be changed simultaneously to expedite the arrival of the Debris Response Team (DRT). Six times. Did I mention six times? Six. That’s how many debris sites Commissioner Thurston said they had gone out on. That’s about $5,000 per site so far. Also, just doing the math, the boat has a 16 gallon tank, and in four years, they have bought 64.87 gallons of gas, meaning they’ve used 4 tanks of gas in 4 years. Tune in next time to see how this highly trained DRT springs into action! He’s been here a long long time. Next articleS1:E3 Debris! Debris!! Debris!! !